A Day Dreamer's World: Tag: 50 Facts about Me! If you didn't know from the name of this blog, I can be found constantly day-dreaming. My name, Sophie, is Greek for Wisdom. Currently I'm 14 and my birthday is on May 11th! Coincidently, 11 is my lucky number! My hair is almost all of the way down my back! It's pretty long now. I have a younger sister who has nothing in common with me! Apart from blogging and reading, my other hobbies are writing and cooking. To start with an easy one, my favourite books are: The Hunger Games by Suzanne Collins, Throne of Glass by Sarah J. Maas, Breathe by Sarah Crossan and The Knife of Never Letting Go! I've been so lucky to meet many of my favourite authors: Patrick Ness, Holly Smale, Michael Morpurgo and Kate Maryon. As well as Andy Robb! When I first began blogging my mum said to me, "Don't get too obsessed" - I can't help but laugh everytime think about this! I'd say I'm a night-owl, as I always feel more alive at midnight than midday! My house is always way too noisy during the day. I'm a huge fan of Imagine Dragons and turn up the radio everytime one of their songs is played on the radio. I may even attempt to dance. I have an obsession with Costa and Starbucks - mainly their Hot Chocolate! For Christmas, I want my own machine for my bedroom. The cinema is one of my favourite places! I cry during most films - especially when watching Never Let Me Go, Now is Good and Marley & Me! I always end up laughing when I see the Minions from Despicable Me and have a collection of Smurfs on my windowsill! I'm a Teenage OAP in the fact that I'd prefer to be at home curled up with a book and a hot drink rather than outside with friends! I'm currently in Year Ten which means I've now started all my GCSE Coursework, which is really frightening. I've been quoted saying, "I've got a feeling I'm going to being turning grey" quite a few times already! My favourite subjects are English(Obviously! ), History and RE! I never had much interest in the latter two before secondary school but now, I can't get to those classes fast-enough! Over the past few years, I've played recorder, violin and guitar, but gave them all up. I've recently become really passionate about creating a better future for this planet and ending global-warming. I like to know what is going on in the world and getting to have a say! A poem I wrote called 'Life is This' is going to be published in an anthology this November! I cried(happy-tears) when I got the letter through the post! I've always hated doing sports although I'm not sure if it's the fact I'm really bad at them or whether I just don't like the sweat. I think it's a mix of both. I can both ice and roller-skate! The furthest I've ever travelled is to visit London for a competition final held at the Royal Society. It was the most prestigious place I've been to in my lifetime! One of my dreams is to go to New York for BEA with a bunch of bloggers(Amber and Rita) - staying at the Library Hotel of course! As for dream places to live, a pent-house in London, New York or Paris would be perfect! If I published a book one day I would know I'd made it! Over the past 14 years, there's been phases where I've wanted to be a Vet, a Veterinary Assistant(As I decided I didn't want to put animals to-sleep), a singer, actress and model. I've now settled for anything to do with writing, working in publishing or making-films. If all else fails, I'd like to teach! I always have one television-show obsession at a time - right now it's "Harrow: A Very British School" - all about life at one of Britain's best boarding-schools. I always keep a bunch of post-it notes on my bed-side table and am constantly scribbling notes on them! This has only been the case for a few months now after my old English teacher suggested I did this. I now use them for everything and love how organised they keep me! I always need a notebook! I feel like everytime I don't have one near I'll have a brain-storm and end up forgetting it later! My favourite colour is purple! I've gone through phases where blue, white and green have also been! I like to pretend I'm good at fashion but really I'm not. I can only survive a mere few hours of clothes shopping before wanting to give up and go to get food! Yes, food. Even though I have a hatred of clothes-shopping, that doesn't mean to say I don't like other types of shopping. Personally, I adore browsing Waterstones and WHSmith, as well as looking at all the accessories that can be found for such a low price at Primark and Stationary Shopping! My main inspiration is Jennifer Lawrence for being herself no matter what - as well as extremely talented and hilarious, of course! I am an accident waiting to(or already happening) in the kitchen! I always accidently spill or break something! I used to have a pet tarantula called Tammi but, I've always been much more fond of my cat called Mitsy and my guinea-pig Fluffy. Following that, I am a complete perfectionist. I find it so difficult to resist the urge to rip up my schoolwork when I make a mistake! I can't help but correct someone - mainly family members - when their grammar is wrong! My family is guilty of using the present tense when they're talking about the past tense. It's possibly one of my pet-peeves. If I could vanquish something from today's society it would be stereotypes: perfection, teenagers, geeks and nerds. Them all. Ice Cream is one of the best treats - beside chocolate of course - and my No.1 flavour is a double-scoop with Cookies & Cream and Chocolate. Mainly my diet consists of chicken-nuggets and pasta - it's an endless craving! I'm much more confident online than I am in the real-world. I struggle around new people and with making friends, although blogging has definitely helped me grow as a person! My main form of procrastination is Twitter or Youtube. I've recently discover the world of Youtubers and can be found constantly watching Zoella's channel! When you read a lot of books, you become a fan of a lot of things. I'm a part Tribute(that is super-excited for Catching Fire in less than two months! ), Caster, Divergent and Nerdfighter. I always want to give 100% in everything I do - meaning if I want to get to something, I can be very determined. Thank you to my BEA Buddy Amber for tagging me to do this! Now, I've got to choose some people to pass this onto! It's really fun to do(Although I did finish writing out the facts at midnight) and I did have to dig quite deep to make myself sound much more interesting than I actually am! So, I tag: Sunny, Ruby, Charli, Rachel and Hawwa , not forgetting the other member of our Library Hotel Party, Rita! . But feel free to do it and share this around! Do you think we could slip away to Narnia and no-one would notice? No need to leave then! Yay! OMG I would love to go to BEA. 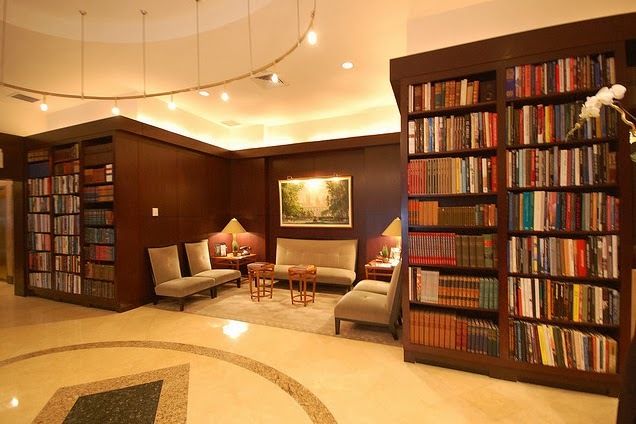 The hotel is just every book lovers dream!!! I really like this tag and I might participate. I know! BEA looks fantastic - and so much fun! And the Library Hotel looks like a place that belongs in dreams. I'd love to see you're 50 Facts Tag too! I had so much fun reading this post. We have so much in common! I am a massive Swiftie, I'm going to her concert later this year. Ice-Cream is like my weakness, I see a tasty flavour and it's like I loose my self control. BEA is like my dream destination, I would be like a kid in a toy shop. Can I come with you guys? Thanks for tagging me, I'm off to write it now and I shall post it later this week. Thank you, Hawwa! I'm really glad we have a lot in common - so much to talk about now! And, I think ice-cream is everyone's weakness. But, you're forgiven! OF COURSE YOU ARE COMING - HOW COULD YOU NOT? I'm pretty such you'd find a way to stowaway in our suitcases anyway! SLUMBER PARTIES AT THE LIBRARY HOTEL SOUND PERFECT! THIS HAS TO HAPPEN! I have sat no GCSE's yet but do Maths and English Language at the end of this year - I am so scared! I just hate the thoughts of exams and pressure! I definitely want to do English at A Level and have also been thinking a lot about doing History or RE.